I am broadly interested in understanding trait evolution and adaptation in plants, including how plants have adapted to different historic climate scenarios and how human influence has shaped patterns of evolution in crops and medicinal plants. My dissertation research focuses on the evolution of underground storage organs, primarily in the lilies (the order Liliales). I am particularly interested in the genus Bomarea, which has unique underground morphologies and occurs across a broad range of environments in Central and South America. I use statistical models, genetic and morphological data, and species occurrence records to understand the history of trait evolution in this group. See below to learn more about some of my current research projects. The Páramo de Frontino, in Urrao, Antioquia, Colombia. Image from "The botanical cabinet: consisting of coloured delineations of plants, from all countries, with a short account of each, directions for management, &c &c." Illustrated by George Cooke, 1817. ​Humans commonly influence the evolution of plants by transporting them from region to region and selecting which 'desirable' characteristics are passed on to the next generation. However, the process of domestication is not well understood beyond a few model species. In this project, I am investigating the extent to which humans have influenced the evolutionary history of Bomarea edulis, a widespread tuber crop that was cultivated in the Americas before European conquest. ​I am collecting DNA from populations across the Americas through a combination of fieldwork and herbarium-based sampling. I am also incorporating trait data on the plant's edible tubers and gene expression data on candidate genes involved in starch synthesis and tuber development. I will integrate these data in a phylogeographic framework, testing hypotheses about selection on relevant traits, demographic history and migration patterns, and within-species variation. Some plants store water and energy in the form of starch in modified organs underground. These organs can allow plants to retreat underground during stressful conditions such as winter, drought, or fire. 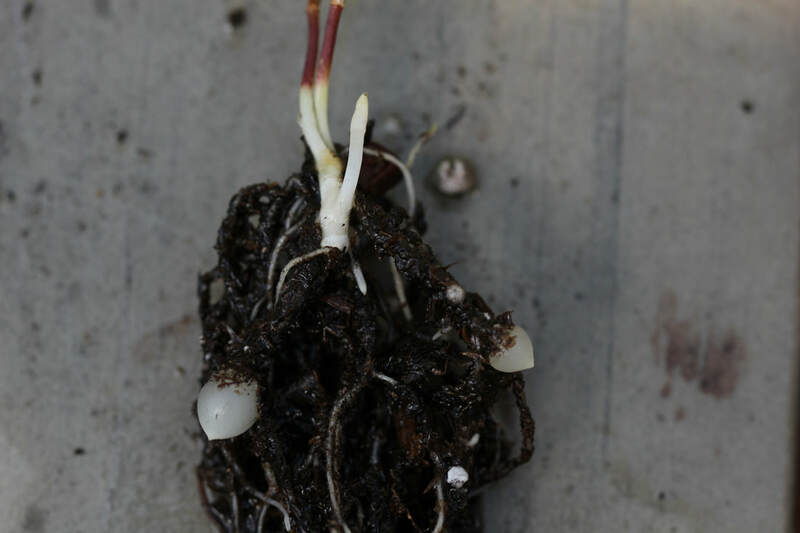 In this project, I am examining how the evolution of different types of underground storage organs, such as tubers, rhizomes, corms, and bulbs, has allowed plants to adapt to historical climatic conditions. The lilies (order Liliales) is a large and diverse group of plants with various types of underground organs. I am testing how underground storage evolution correlates with climatic niche evolution and patterns of diversification in this group. Many plants form root tubers to store starch, water, and other nutrients. However, the genetics and development of root tubers has yet to be addressed in a monocotyledonous plant such as my study system Bomarea. In collaboration with Jesus Martinez-Gomez and other members of the Specht lab at Cornell University, I am using comparative transcriptomics of tuberous and non-tuberous roots of Bomarea multiflora to identify what genes underly the formation of these fascinating storage organs. In collaboration with Dr. Iryna Dronova from the College of Environmental Design, we are testing a new remote sensing metric of heat and greenness in urban environments. Often, racial minorities live in neighborhoods with less greenspace, trees, or other landscaping. The lack of vegetation can change the microclimate of these neighborhoods- trees and other plants help keep the areas cooler. The increased heat can have negative health outcomes for residents, contributing to environmental racism. We are testing the new metric using data on city heat, greenness, and the racial composition of city blocks in several California cities.